This little duckie needs to be quick-quack-quick — leaping out of the mud, scooting under the hedge, running around the flowers, and skipping over the stones. Now he can splash into the river, where his mom and siblings are waiting and ready to go! Quick Duck's urgent pace will captivate its audience. Duck is jumping over stones and running through mud, but where is he going? My first time reading the story I didn't even think that he had a destination in mind, the narration seems to just point that Duck is moving through all these obstacles with key words like under, around, down, and out. 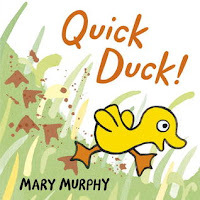 I assumed Mary Murphy's intention was to make the story a visual learning experience. The ending proved me wrong. Duck is going somewhere all right, and I have to admit that what's waiting for him at the end of the story is not what I expected! Quick Duck! is perfect for ages 1-3. The sentences are structured the same, and I'm thinking that the more the story is read to a child, the more they'll remember it and be able to read along. It's also notable that Quick Duck! is a board book with vibrant illustrations and easy-to-turn pages. The story is a quick read, so don't be surprised if you're asked to read this one over and over again!